Wing Chun Weapons: Traditional and New! 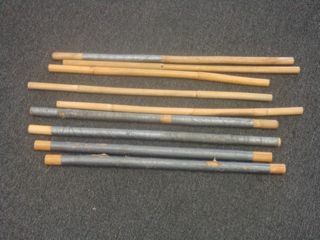 There are only two traditional Wing Chun weapons, the Butterfly Swords and the Dragon Pole. Since there’s only two weapons, it makes it very easy to remember and master them (Okay, maybe not easy to master). At the same time though, many non-traditional Wing Chun weapons are trained today like kali sticks, knives, and even hand guns. ** Note: when defending against an opponent with a weapon 1) Avoid the conflict - flee; 2) Avoid the conflict - use your words, street smarts, guile to diffuse the situation; 3) Better the odds - grab a weapon or improvise a weapon; 4) Train, train, train. The Butterfly Swords is an ideal Wing Chun weapon since we train to use both hands at the same time. With the Butterfly Swords you get two identical swords, one for each hand, to fight with. The Chinese name (in mandarin) is “Ba Zhan Dao”, which means 8-slash (or cut) knives. (You can see many examples of other Chinese swords here.) The Butterfly Swords is a Shaolin weapon. And since Shaolin monks are forbidden to kill, the Butterfly Swords doesn't have a sharp point. It's not designed for stabbing, just for slicing, cutting and chopping -- your enemy. Although they’re not effective for stabbing, in a pinch you can stab if you want … and why not? Metal vs. flesh … flesh loses! The weapon is designed with a hand guard that protects the hands in combat. And in close range you can easily use the hand guard like a pair of brass knuckles to smash your opponent. There’s also a hook that starts from the top of the handle and follows behind the back of the blade, shorter than the blade. This hook is used for grabbing action. What you do is cup an opponent’s weapon in the hook's opening, give your sword a twist, which crates friction and locks up the opponent’s weapon inside the hook. Now you can use your other sword to do some quick cutting. In Chinese (Mandarin) the Dragon Pole is called "Liu Dian Ban Gan", or six and half point pole, which reflects that fact that there are only six and half moves in the Dragon Pole form. In addition, however, the few number of moves is probably due to the fact that a Dragon Pole can measure anywhere from 8 to 13 feet (up to four meters) in length! For practical reasons, a weapon that long is limited to what a normal person can realistically do with it. But, this doesn’t mean it doesn't work. It’s purpose is for fighting at long distance, clearing a wide area, and it’s a great weapon for fighting multiple attackers and keeping them at bay. This weapon's origins are found in Filipino martial arts and it fits in perfectly with Wing Chun’s two-hands-at-the-same-time ambidextrous nature. Similar to the Butterfly Swords you use two weapons (one for each hand). In this case, instead of two swords you fight with two sticks. Kali sticks are very adaptable and practical in today’s world. You’ll have an easier time finding two sticks to fight with, instead of two swords. In fact, at my gym our sifu sometimes uses axe handles instead of the regular rattan or bamboo sticks. And while fooling around at home I’ve used two child sized aluminum baseball bats in place of the sticks. Now that's awesome. Any knife will do. And they're practical because you can find a knife in any home or office. 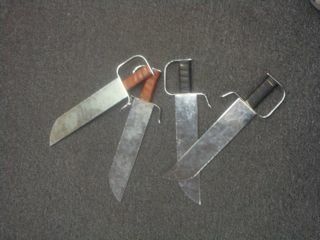 We use plastic, rubber, or wooden knives for training. Many of the Butterfly Sword moves can be adapted to the shorter knife, too. The main difference, of course, is that it’s shorter and the moves must be applied at very close range. We don’t do any target practice at my Wing Chun club. Instead, we’ll train disarming someone with a gun. Pay special attention to the “*Note*” section above… When faced with an opponent using a weapon -- avoid the conflict. But if you’re cornered and there’s no chance of diffusing the situation AND the psycho is inside your reach... train, train, train at disarming him (or her) by turning off the brain. The brain after all, is the weapon. Wing Chun is a street fighting martial arts style. So, improvising weapons is always advised. If you can’t flee and your opponent has a weapon, you must even the odds by getting or improvising a weapon. A stick, belt, coins in your pocket, keys, pen/pencil, dinnerware, chopstick, pipe, sports equipment, home or garden tools, towel, etc. Basically anything sharp and pointy or blunt and heavy works well. Other options are projectiles, something you can throw. Or something you can swing or whip (like rope, wire or chain). And of course anything that will confuse or slow down your opponent(s) giving you an advantage -- sand, chili powder, black pepper, water into the face, etc. Have A Great Story About Wing Chun, or Other, Weapons? Do you have a great story about this? Do you train with weapons? Which ones? Do you want to share photos or video of it? Do it!